Last week saw the opening of the first stand-alone Ground store in Belfast. The chain has 2 popular outlets situated in Next and Waterstones in the city centre, but it is exciting to see them open their own space. I've been visiting Ground for a few years now and have been eagerly waiting for the opening of this new venture. I currently car-share with my other half who starts work at 8am. I, however, don't start until 9.30am. That's a whole lot of time I could be spending drinking coffee! Unfortunately, Ground's other locations have their opening times dictated by their host stores so it's great to see that this new coffee shop will be open from 7.30am during the week. I have been on annual leave since last week so wasn't around to visit on the first day but I made a concerted effort to call in on Saturday and see the new space for myself. The unit is spacious and benefits from a long walls of windows, creating so much light. The use of dark wood and contemporary greys, contrasted with pops of vivid yellow has created a modern and welcoming environment. I love the simple idea of a book swap shelf. Read a book, leave a book. Pass on something you've enjoyed so someone else can discover it. I ordered my usual flat white (I blame Ruth from Willow Lane for getting me hooked on them) as seeing as it was approaching Easter, I indulged in one of their infamous Creme Egg muffins. I chose a cosy nook and spent an hour flicking through my iPad, drinking good coffee and watching the folks of Belfast busy-by the windows. I return to work tomorrow and I can already confirm this will be my new "local"
Good luck to the team at Ground with the new store! Earlier this month I was invited to the Cos store in Dublin. I had previously attended the SS16 preview and I was excited to see the new collections in full. Spring is the season of renewal and revitalisation, it's the time when everything starts afresh and we can apply this concept to our own styles. Cos' Japanese-inspired designs, utilising kimono details, unconventional silhouettes and luxurious yet functional fabrics are ideal for injecting new life into your wardrobe. This graphic print has been used on several pieces in the new season collection including a top, shorts and this striking coat. Open Front Boucle Cardigan £59.00. I bumped into Adam Gaffey of MFI magazine. Adam is hugely passionate about the Irish men's fashion industry and it was a pleasure to grab a quick chat with him. Stomping the cobbles of Temple Bar in my Samuel Windsor brogue boots. The folks at Cos kindly gave me some pieces from the new season collection so I took to the viewing pad of Victoria Square for a little street style photoshoot. Made from super soft cotton, the sweater has a contemporary square neck with distinct ribbed texture. I paired the sweater with simple pale grey chinos and my ubiquitous brogues. I've spoken before about my hair problems; thick, heavy, hard to manage (sounds a bit like myself) and how quickly it can grow. Wahl kindly sent me their Haircut and Beard Trimmer to trial and so I enlisted my hairstylist again to put it to the test. 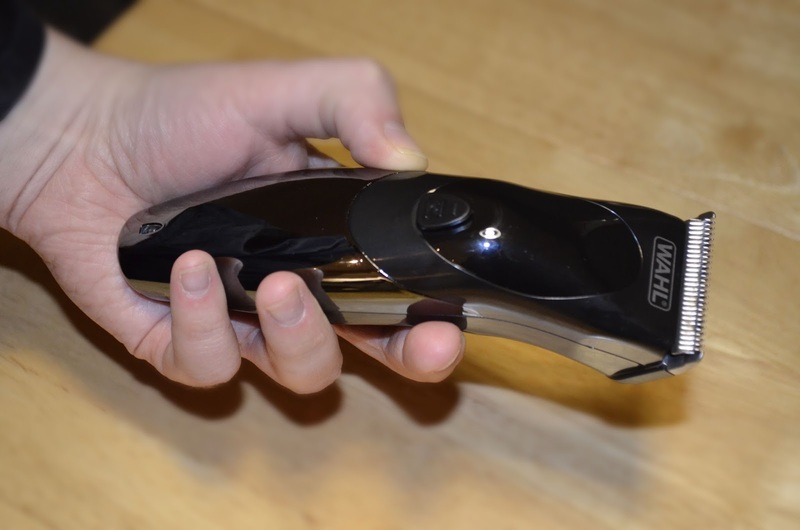 A compact and lightweight unit, the trimmer itself fits easily in your hand. It can be used cordlessly, handy for when you want to trim your beard in the bathroom but can be used while plugged in should the charge begin to drop. 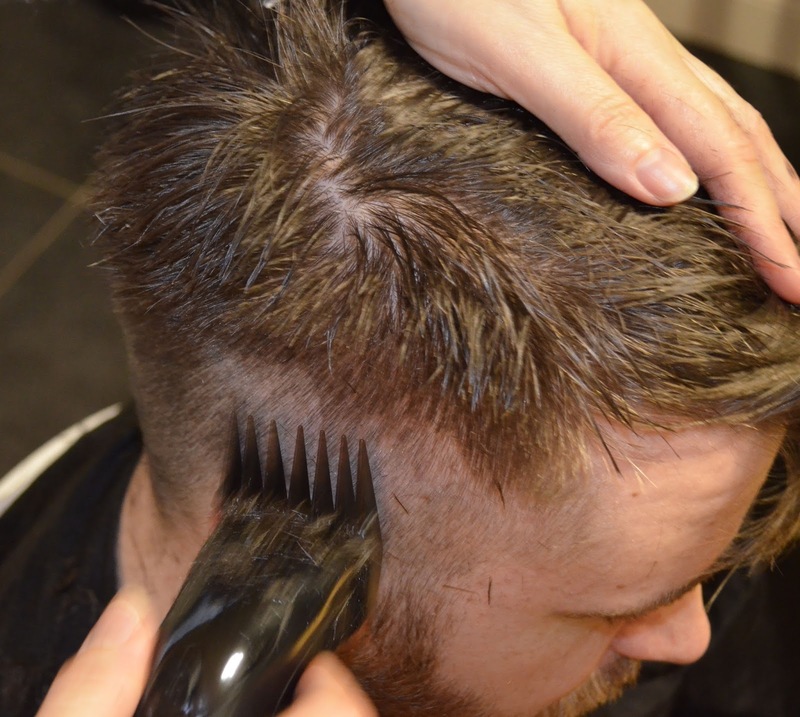 Included with the kit is a FULL range of guards, 12 pieces going from 0.5 all the way up to 8 meaning you can shape and groom your hair in pretty much any style you want. There are also handy tapered guards for working around your ears if you are that skilled. The unit has a 45min running time on full charge and it made it through my hair and Caelan's hair on a single charge. 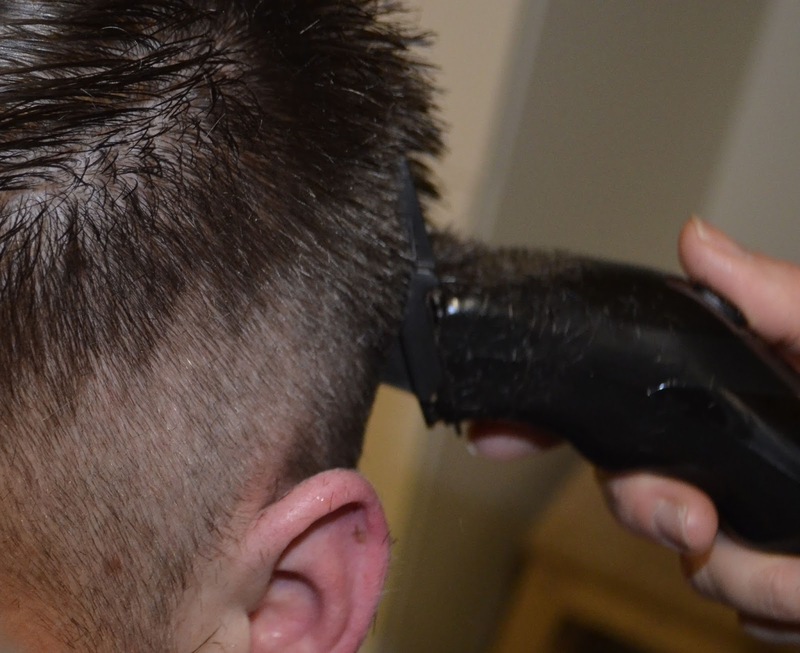 We both have thick hair and it made short work (haha) of our manes; I was dubious as to how well such a relatively small trimmer would cope with our hair but the precision blades quickly and effortlessly buzzed through. I went through a few guards to see how easy they were to use, going from 0.5 to 3 across the fade around the back and sides of my hair. The guards are quick and simple to swap, they pop off easily but click on securely so you are assured there is no chance of them coming off during use. 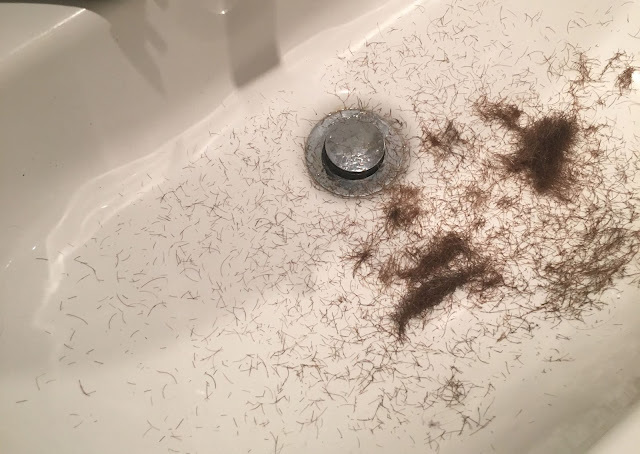 After my haircut, I used the trimmer myself on my beard, working on an all-over #5. I didn't want to lose too much length but my beard needed a good tidy up, and this guard got rid of all the straggly, stray hairs but kept the fullness. 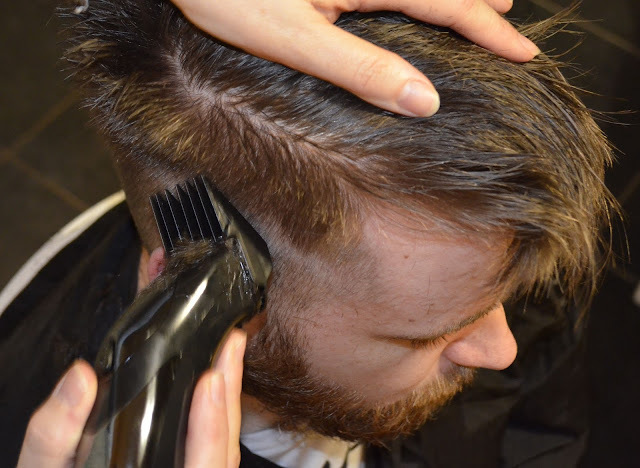 In addition to the clipper and guards, the kit also includes 3 combs and a pair of scissors; these are invaluable when it comes to trimming around your moustache. And all of this can be bought for under £20! You can buy the Wahl Haircut and Beard Trimmer kit from Argos, but check out the full range of professional and home grooming equipment and solutions here.